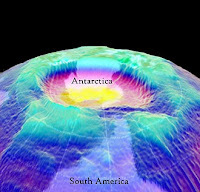 Antarctic ozone hole caused by the depletion of the ozone layer among certain altitude across the Antarctic in the spring. The depletion seem to happen every year since a decade ago. The formation of the 'hole' is apparent every September and recovered to normal on through the spring or early summer. In October 1987, 1989, 1990 and 1991, the ozone hole has been observed for the whole of Antarctica to rise 60% reduction in ozone compared to the pre-ozone hole paras. In October 1991, the lowest paras atmospheric ozone ever recorded has prevailed throughout Antarctic, and two main reasons for the 'hole' CFC caosed increase in atmospheric and unique environments in winter weather throughout Antartctic at certain altitude in the Antarctic. The Stratospheric temperatures cool justify ice crystals are formed. In these clouds, chlorine molecules released from the CFC during the cool polar darkness. If the light of the sun begins in September in all of Antarctica, the number of chlorine molecules will decrease due to UV action because the formation of chlorine atom-ozone destruction. The chlorine molecules react with O3 of the Sun began in September in all of Antarctica, the number of chlorine molecules will decrease due to action of ultra-violet (UV) because the formation of chlorine atom-ozone destruction. Depletion and hole of ozone layer happens here. The hole is the result of solar energy that emit ultra high radiation. Radiation was broken to become oxygen molecules simultaneously releasing free atoms in which half tied with other oxygen molecules to form ozone. (Ozone) with the outlines Ozone and ozone layer thins. That was the formation of depletion and hole in the layer of ozone.